You don’t need me to tell you that we are living in a time of more political activism than our generation has ever faced before. All eyes are on Washington D.C., and while popular culture can often provide an escape during these troubling times, some seek to see their reality presented in a different light. Politics make for fascinating stories, and it’s hard to lock the topic into one genre. Politics seep into our pop culture so often that there was even a politics storyline on Arrow, though I wouldn’t exactly use “entertaining” in describing that plotline. Some shows handle it better than others. House of Cards is probably the first to come to mind when it comes to political storylines. This show has been dark from day one, but has certainly delved into more terrifying and brutal drama over its four seasons. You can’t help but root for Frank Underwood a bit, but this show is simply grim sometimes and terrifyingly good always. Then, there is ABC’s Scandal, which has turned from a fascinating and fun show about conspiracy and publicity to a psychotic fan-fiction parody of itself. Was it ever really about politics in the first place? On HBO, you get the most frustrating show on television, Veep. I say frustrating because that is a show where no one wins. The exhausted staff of Vice President Selina Meyer have spent five seasons scrambling for success and right when you think things are moving upward, the show tricks you again. This one strikes at something we are dealing with too often in reality. Look here for wonderful comedy, but not too much escapism. So where is there hope for escapism blended with reality? Certainly not Designated Survivor, right? Or those others House of Cards copycats from networks? If you’re looking at shows on the air, you’re looking in the wrong place. 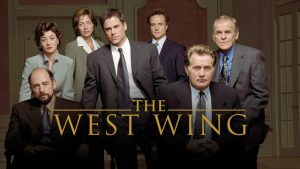 In 1999, fresh off of launching his first television show, Sports Night, Aaron Sorkin launched a second show called The West Wing. It took the country by storm. It ran for seven seasons and followed the staffers in the White House for President Josiah “Jed” Bartlet, a Christian Democrat from New England with a PhD in economics who spends his free time spouting useless facts to his staff. Basically, this show is spectacular. The staff is comprised of brilliantly intelligent women and men, all talented and skillful and eager to change the world. From Press Secretary, to Director of Communications, to Chief of Staff, each character is relatable. Yet what makes this show so engaging is how “behind-the-scenes” it feels. There’s a sense of urgency in the work being done and all of the issues discussed and rallied around are ones that are relevant, maybe even more relevant, eighteen years later. For those frightened of being immersed in Hollywood’s interpretation of issues, be not afraid. This show covers all bases, does it logically, and doesn’t wait for you to catch up. Yet, it is about more than politics. On top of everything, there’s a sense of patriotism amongst the struggle. Every character is angry with how much they want to get done but how much they are pushed back by bad publicity, a selfish congress or just dumb rules. Nevertheless, they persist. Each character has a drive and a fire in them that doesn’t dampen when they hit a wall. They don’t rest or wallow. They look at the obstacle and keep moving. In short, The West Wing is the perfect show for you to watch right now. Not only do you learn a little something, get a little inspired, and have a blast every episode, you are left with a critical lesson. Hope can be found in the struggle. All seven seasons of The West Wing are currently available on Netflix streaming.